Gone are the days when you had to make a physical trip over to the local video rental store and thumb through the available titles. There are now many online services that stream both blockbuster and obscure movies over the Internet directly to your computer, set top box, smart TV or even your mobile device. Five of the major online movie streaming services are Netflix, Amazon Prime, Hulu Plus, YouTube, and Crackle. They range in price, selection and mobile support. Most services that stream movies over the Internet offer apps for set top boxes like the Roku, a range of smart TVs, and even video game consoles like the Xbox. You are not bound to your computer, though that is certainly an option too. Easily one of the biggest names in this space is Netflix. The company started out with a DVD-by-mail service before switching primarily to online streaming. One of the biggest advantages that Netflix has over the competition is the sheer size of its library, the entirety of which is available to subscribers for $8.99 per month. This includes a broad range of movies and TV shows, as well as award-winning original programming like House of Cards. Many smart TVs, smart Blu-ray disc players, set top boxes, and Internet-connected media players support Netflix streaming. Library: Movies typically become available on Netflix shortly after their retail release on DVD and Blu-ray. The selection is very impressive. 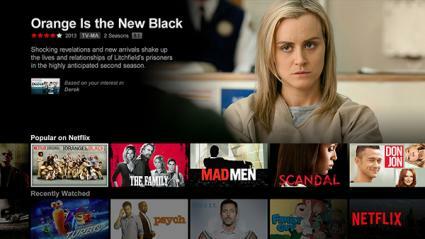 Netflix also has a growing library of TV shows and original programming, like Orange is the New Black. User Experience: Navigation through most apps designed for set top boxes and similar devices is designed as a series of rows of cover images. One row may contain items on the member's saved lists, another row features recommendations based on viewing history, and yet another row highlights programming currently popular on Netflix. 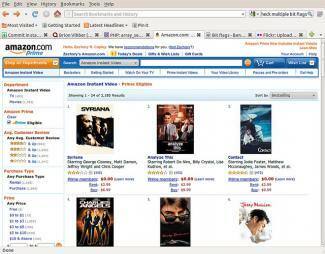 It is intuitive to use and it is easy to add movies for later viewing through the "My List" feature. There are effectively three different business models that are all encapsulated by Amazon Prime Instant Video. First, it is possible to purchase a digital download of a new release movie for around $17.99. Second, a smaller selection of movies are available for rental for around $3.99 each. The third and most cost effective solution is the unlimited streaming model offered with an Amazon Prime subscription. This includes not only unlimited streaming of movies, TV shows and music, but it bundles in the free 2-day shipping feature for purchases on Amazon itself. The unlimited streaming is a value-added feature to the regular Amazon Prime membership. Library: Amazon Prime Instant Video offers a large library of top-tier movies and TV shows for streaming, including the majority of new releases. Amazon has signed a deal with HBO to allow streaming of their original programming too. User Experience: The Amazon Prime Instant Video service is easily enjoyed on any Internet-connected computer via a web browser and Silverlight software. Mobile and other device support isn't as strong as Netflix, however, with the best mobile experience coming from Amazon's own family of Kindle Fire tablets. As a joint venture between NBC Universal (Comcast), Fox Broadcasting, and Disney-ABC, Hulu started out as a free online streaming service for many of the companies' respective television shows. The premium Hulu Plus service was introduced in 2010, providing subscribers with a larger content library and support for a larger number of platforms. While Hulu Plus does boast some movies, its primary focus continues to be television shows, as well as webisodes and other shorter-form video content. Library: Hulu features content from such networks as Speed, SyFy, USA Network, BBC, Onion News Network and AMC. The selection of movies is limited and you won't find new releases here. There's a nice variety of films for children though, and several popular movies from years past, such as Hook and the original Men in Black, that you can catch up on. Hulu and Hulu Plus are only available in the United States. User Experience: Hulu Plus is supported on a growing number of platforms, including the Google Chromecast, Apple TV, Roku, iOS, Android, Windows RT and Windows Phone. The user experience is a very visual one with the highlighted content typically taking up a large portion of the screen with a large image. Other sections are showcased below that. YouTube may be one of the first names that comes to mind when thinking about free streaming video, but it is best known for its range of user-created content on channels like Epic Meal Time and Mental Floss. 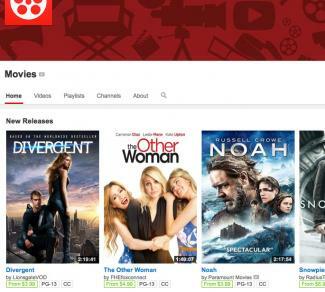 However, the Google-owned property also has a number of Hollywood movies available for rental starting at $3.99 each. These can be found through the YouTube Movies channel and include films from eOne, Paramount, Sony Pictures, Fox, Warner Bros and more. Films are available to watch for 24 hours after purchase. Price: Most movie rentals are $3.99 to $4.99, but can go as high as $7.99. Library: While the vast majority of video content on YouTube is free to stream, the films offered through the YouTube Movies channel are available for a fee. While you won't find last month's blockbusters, many of the titles are fairly recent. There is also a large catalog of movies that may be difficult to find now on Blu-ray or DVD, many of them older films. User Experience: Anyone who is familiar with watching videos on YouTube will have no problem watching the paid movie rentals through the service as well. Device support is very strong, with YouTube apps being found for nearly every mobile platform and smart device, as well as through a web browser on any computer. One of the best free options when it comes to streaming movies online is Crackle. The library is not nearly as large and expansive as what you may find with Netflix or Amazon Instant Video, but the free price tag is very attractive to many users. The available movies and TV shows span a broad range of genres including action, horror, science fiction and comedy, and Crackle is developing original series' too, like Comedians in Cars Getting Coffee with Jerry Seinfeld. Since the service is free, many of the streams can get interrupted by commercials and advertising. Library: Crackle features a good variety of high quality movies and TV shows, but it typically does not offer the newest releases. Movies that are a few years old, like Angels & Demons, Superbad and The Exorcism of Emily Rose, are more typical of what can be found on Crackle, as well as slightly older films like Ace Ventura and Beverly Hills Ninja. User Experience: The video quality is typically not as good as some of the paid services and the commercial interruptions can be distracting, but the user interface is intuitive and responsive. The convenience of having access to a massive library of movies and TV shows to stream at any given moment has revolutionized the home entertainment industry. Consumers have many choices for online streaming services both on mobile devices and from the comfort of their living rooms. Between the free options and the affordable paid plans, fans of any movie genre will find lots to enjoy.